The Whole Megillah (TWM): What has led you to write memoir? What are the greatest challenges and the greatest satisfactions? Mimi Schwartz (MS): I had been writing fiction and poetry until we spent a year in Israel in 1972-73. There I wrote a long piece called “An American Family Abroad” and our local newspaper, The Princeton Packet, published it as a three-part series. I received lots of positive response, and I was hooked on writing about real life—with all its messy contradictions. For me, the greatest challenge in writing memoir is to be honest and fair to the people I write about. I want to portray them as I experience them but I also include what I call OPV or Opposing Point of View. In other words, I try to include their points of view, especially when they are different from my own. When I wrote Thoughts from a Queen-Sized Bed about my life in a long marriage, my rule of thumb was whenever I called Stu a moron, he got to call me an idiot. He loved the book, even though it showed the ups and downs of our relationship. We stayed married, fifty years, until he died. I‘ve used OPV ever since. In my recent book, When History Is Personal (University of Nebraska Press, 2018), for example, I write about what I felt was an anti-Semitic incident at the college where I teach; my good friend there saw it differently. The tension between her view and mine makes for a more complex and more interesting story—and we have stayed friends her creative flame alive among book reports and term papers. The greatest satisfaction in writing memoir is when I write about hot button issues, such as anti-Semitism, and keep those who may not agree with me will keep reading. Memoir puts a face on social issues and over-simplified answers become more complex, creating more understanding and empathy. In our polarized age, we need more of that. TWM: What led you to change the name of your father’s German village to Benheim? MS: There is a tradition of changing the names of books about small villages. Two of the best known examples are Christ Stops and Eboli and Village the Vaucluse, so I was following that tradition. Partly it is about privacy. If you write about a village of 1,200 and say “the postman’s son,” there is only one postman,” so to name the village is to identify him, even if there is no good reason to do so. TWM: How has writing about your family’s past changed your present? MS: The older we get, the more we begin to look backwards as well as forward, trying to understand the legacies that have shaped our lives. When we are young and our mother annoys us, we say, “I’ll never be like her!” When we are older, we realize, like it or not, that we are like her more than we thought. Writing about the past helps me to understand the past—and my mother, father, and all who came before. I make connections between who I am and the past that shaped me. TWM: What was your method for organizing the essays in When History Is Personal? MS: My inspiration is always an anomaly or a question. If I know an answer before writing, I tell myself that I’m writing the wrong story. I write to surprise myself, to solve a puzzle, or at least to wrestle with that puzzle. TWM: Are there any special challenges in writing Jewish memoir? MS: As an American Jew, born here to a family that fled Hitler’s Germany in 1937, the family legacies I deal with are rooted in being Jewish. That is true even as a live on my American street with a history that goes back to the Revolutionary War. In When History Is Personal, the challenge was to capture the complexities of assimilation: how much does being Jewish shape my American life. What do I give up and what do I keep—and how are my choices the same as other American Jews. I see my audience as everyone, not just Jews, so I want to my stories to speak to all who deal with assimilation—whether you are the last German Jew in an apartment house full of Hispanics in Washington Heights (“It’s Just Like Benheim”) or an Israeli Jew, living in New York, whose ongoing friendship with Salach, an Israeli Arab he’s known since boyhood, thrives despite all the political turmoil (“Echoes from Across the Road”). TWM: What do you hope readers take away from When History Is Personal? MS: I want my readers to be like the young gay man from New Orleans and a nun, Sister Irene from Ireland, who told me after a reading how much they related to my stories. I don’t know how or why; they came from different worlds—and yet they found common ground. I loved that. I also want readers to think about—even write– how their individual stories connect to the larger history that shapes their lives. TWM: What advice would you give to aspiring memoirists? MS: To write something you don’t already know and surprise yourself. To remember to be a storyteller, which means the details in your head have to be on the page. To ask yourself, after you have a draft, “Why of all the stories I can tell, am I telling this one?” By your last draft, your answer should be on the page. Mimi Schwartz is Professor Emerita of Writing at Richard Stockton University. 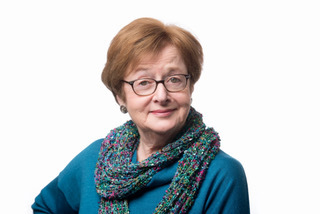 Her books include the newly published When History Is Personal; Good Neighbors, Bad Times – Echoes of My Father’s German Village; Thoughts from a Queen-Sized Bed; Writing True, the Art and Craft of Creative Nonfiction. Her short work has appeared in Agni, Tikkun, The Missouri Review, Arts & Letters, The Los Angeles Times, and The Writer’s Chronicle, among others, and ten essays have been Notables in the Best American Essays series. 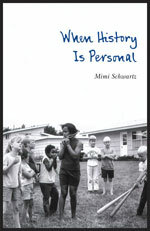 This entry was posted in Authors and tagged american jews, german jews, Holocaust, Jewish memoir, mimi schwartz, when history is personal. Bookmark the permalink.